David Glickman works with organizations that want to add some comic relief to their events in order to make them really fun and memorable. With a portable keyboard slung over his shoulders on a strap, he combines humor and music in an exciting customized presentation unlike anything you've ever seen. David has been a professional speaker and entertainer since 1985 and has presented over 2,000 programs. He has appeared on "Evening At The Improv" and several other national television shows. He has also been the opening act for stars such as The Beach Boys, Engelbert Humperdinck, Ellen DeGeneres, Ray Romano and more. David has worked with Steve Martin on a comedy project for CBS-TV and has performed at private parties for singer Gloria Estefan and former President Jimmy Carter. In 1994, he was voted "Funniest Person in America" in the Entenmann's National Comedy Contest. David is also a business owner, so he is able to share lots of common sense business strategies with his corporate audiences. He's owned several comedy clubs in the South Florida area and in Atlantic City Casinos, which garnered praise in Rolling Stone Magazine and other publications. 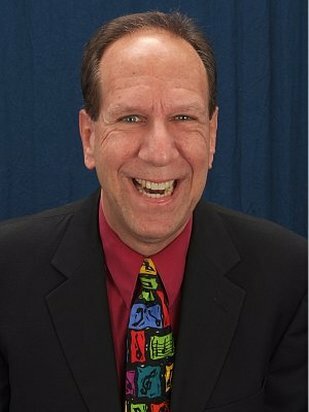 David specializes in customized business humor, and is an expert in "finding the funny" in the many Fortune 500 companies to whom he has spoken. He's the author of Punchline Your Bottom Line: 76 Ways to Get Any Business Audience Laughing with a Foreword by Dave Barry. Why is everyone so serious? Just look around the average workplace and you'll see most employees dealing with the stress of constant change, increased expectations, and having to do more with less. Well, the good news is that there's a successful strategy to approach these challenges. Former professional comedian David Glickman will teach you how Funny Is The New Serious. He'll show you how by changing your perspective you will experience a profound way of handling these frustrations. And you're in for a treat, because "Funny Is The New Serious" isn't so much a traditional keynote presentation as it is a full-blown, high-energy one-man show. It's got observational humor, funny visuals and props, hilarious song parodies, and a big "rock and roll" finish! Discover how to achieve a healthy "Work-Laugh Balance" simply by implementing these easy "jest practices." Open your mouth and say "Ha!" You've never seen a funnier way of looking at Medical Technology, HIPAA, Patient Relations, Managed Care, Medical Specialists, Healthcare Bureaucracy, the Pharmaceutical Industry, Joint Commission, HCAHPS, CMS, and much more! A Dose of Healthcare Humor is designed to positively address situations and frustrations that the typical healthcare professional deals with in his or her job in an incredibly entertaining way. It's non-offensive, non-invasive humor--both clean and clever. And it qualifies for CE and CME! David Glickman puts the med in comedy and the Comedy in Medicine. If you're looking for a program that's strictly entertainment, this one's for you! With Custom Corporate Comedy, no two programs are ever alike. This program of clean, clever, customized material is all about YOUR people, YOUR industry, YOUR products, YOUR services. Your group will be incredibly impressed when they realize that you have had the program created exclusively for them and for this event. David presents the most current and relevant humor for your group's specific industry or place of employment. He can also include a comedic take on any theme or initiative that your group is embracing (or resisting)! David Glickman has more on-stage experience as a Master of Ceremonies than any other Keynote Speaker working today. In his years of owning comedy clubs, he strategically positioned himself solely in the Emcee position, so that he could control the flow of the program, complement the material of the other performers, bring the energy level of the program up or down as necessary, and "save" the show if there were any comedy "disasters." He also used those years of stage time as Emcee to refine his skills and learn the art & science of the role. (And anyone who doesn't believe that emceeing is both an art and a science hasn't done it very much.) Many meeting planners have experienced the amazing value and benefits of having David serve both as a Keynote Speaker and as the Master of Ceremonies for the entire event. It guarantees consistency for the agenda and hilarity throughout the event for the audience.